Tricks to successfully integrating AV into your IP structure. IT, or more specifically, TCP/IP protocol, has been a player in the AV industry for as nearly as long as it has been available. Typically, it was reserved specifically for control or access to PC or computer-based systems, such as audio and video servers, PC music systems, etc. Over the past 20 years, as networks have become more robust, wired and wireless networks have more and faster bandwidth available, and the Internet/ WAN is almost 100% reliable with little or no downtime, more and more devices and services are working their way into the IT scope. Here is what has changed in the past few years, and what you need to know about integrating various devices into your IP structure. In the consumer electronics/CE industry, the professionals who install “smart home” systems, commercial audio/video systems, video conferencing, integrated buildings, and such are known as systems integrators, not to be confused with the same name in the IT industry. 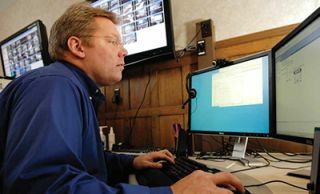 Though they have similar scopes, to integrate disparate systems and occasionally make two systems work together that normally are not supposed to. In IT, this typically deals with software, whereas in the CE industry, it involves both and occasionally, more. In the AV world, this has been accomplished via several methods. Integrators sell control systems, made by manufacturers like Crestron, AMX, Extron and others, whose sole purpose is to provide a backbone or hub so to speak, for various sub-systems to connect to and an easy way to control them. The controllers typically allow for multiple protocols and ports providing connection to multiple subsystems at the same time. So a control system may have an Ethernet port, several comm ports, I/O ports, and other connection ports. These subsystems can include audio and video, lights, motorized lifts, drapes, shades, HVAC systems, waterfalls, and more. These subsystems and devices typically have various protocols they may use to communicate within themselves, for instance many AV components (TVs, projectors) use IR/Infrared, RF, or RS-232 for control. IR works via light, and is only line of sight, but typically doesn’t provide any feedback, thus without looking, you don’t know if the signal made it to a device. RF has longer range, but can be interfered with and typically has no feedback, either. RS-232 on the other hand, is hardwired and provides two-way communications, providing feedback, handshaking and confirmation that the subsystem is on or off or in any other mode. A lighting system may use RF, a wireless mesh network or wired communications standard within itself, but then communicate to the control system via RS-232 or RS-485. A small commercial HVAC system might be integrated with RS-232, but typically a medium to large commercial HVAC system will use BACnet or ModBus or some other semi-proprietary protocol, requiring a field server and special coding to integrate into other systems. Many of the control systems have included an ethernet port for decades, some even provided for dual networks or a “control” sub-network outside but connected to the main network resources (Internet). Otherwise, the ethernet port until now, has primarily been used to connect the system to the Internet and LAN to allow the system to be connected to remotely (outside of the network/facility) and to be controlled via IT devices such as PCs and cell phones to now tablets and smart phones. With advancements in the IT world, we expect to see more and more products use TCP/IP for connectivity and control; it should make integration easier and more robust. This will also require integration of the facility’s IT team and the AV system integrator, to create a reliable system. To the point of secure, two-way communications is a key part of a reliable system, as the system must know the state of all devices or it can become out of synch. For example, if you have a TV in a room with an AV receiver or switcher, a BluRay player, a PC connection and an Apple TV, you need to switch several states to make the system work. If you use only IR or any one-way communications method, you press the PC Presentation button to turn on the TV, but if the TV doesn’t turn on, the system doesn’t know and keeps firing other commands. Thus you may hear audio, see little LEDs on, but there will be no picture. Or, your TV could have already been on, as someone was doing a presentation, and now they want to change to a DVD or Blu- Ray. They press the DVD mode button and the TV, that was already on, turns off, as the IR command only allows you to send “Power”, which is both on and off. Thus, you can see it is important to use a true, two-way communications protocol in a reliable control system, to avoid these common problems with integrated systems. The AV help desk at the renowned Mayo Clinic has so many flat-panel displays and computers that it looks like an airport control center. Its two dozen AV techs run 200 meeting rooms, preside over hundreds of videoconferences a day, and prepare audio and lighting controls for live TV interviews on shows like “Good Morning America.” TCP/IP not only provides two-way communications, but also the ability to get meta data, large strings of information and complete graphics. TCP/ IP as a transport control method (on/off, Ch+/-, Vol+/- , Input, etc) in the past, has been used primarily for PC-based devices, but now is expanding into sources and output devices from media servers (AppleTV, PC-based, etc) to projectors and TVs and other devices. One of the leading control system companies, Crestron, is even teaming up with manufacturers to have Crestron I2P (plug-n-play TCP/IP) built into many products, such as projectors, screens, TVs, and more, allowing easy and direct integration of these devices. To utilize fully and get the most out of any integrated AV system, a static IP range should be given to the control system and the subsystems connected to it, by the facility’s IT team. You may also need to do some port forwarding or even some firewall traversal if required, but at worst, simply design a control system network, if complexities reach that level. Other than basic networking and security knowledge, not much else is required from the IT structure of the facility these systems are being installed into. On the higher end, knowledge of cloud networking, H264, H323, SIP, and other IT related protocols is needed to work with video conferencing, newer voice and audio distribution system and other devices emerging into the market. Dual networks or subnetworks may also be needed and utilized. Without the proper configuration, network issues can throw off an AV integration project, causing odd, non-replicable errors or a completely non-functional system. Coordination between the AV integrator and the IT team will help prevent many of these issues. Further knowledge of firewalls, STIG, and other network security issues and standards will be required when working in and around some high security and military facilities. In the past few years alone, tablets and phones are taking over as the main source of Internet search and usage, and control of and interactions with various systems. Therefore, knowing how to connect your systems to these devices is becoming paramount; a remote connection requires this knowledge plus some port forwarding and DNS manipulation. Additionally, creating security standards around the connection of these systems within your security model is something to consider. The times when no one was allowed to connect any wireless device to your wireless network has gone. You at least need a guest network for customers and clients. Most of the control manufacturers of today’s control systems (Crestron, AMX, Extron, High Resolution Systems, Universal Remote Control, etc) utilize TCP/IP as one of their communications protocols, or at least as a connection method (connecting to the home network or Internet). If you are communicating to devices via TCP/IP, you need the protocols and code from the manufacturer, which are typically released with the product or via the control system manufacturer in the form of a software module. In the past, one would occasionally be forced to write your own module or code to make this work, getting the code from the manufacturer (sometimes like pulling teeth), converting to your coding language (control system specific — usually HEX or something similar), writing code to control functions like On, Off, Stop, Start, Play, etc. These days, most control system manufacturers provide modules that contain most of this “low level” control information and all the integrator needs to do is program the system according to the end users needs (master on turns on TV, turns on amp, switches to appropriate source, etc). In addition, leading control companies like Crestron have certain “partner” programs whereby manufacturers are building technologies directly into devices like projectors, TVs, and monitors, that will allow a control system to connect directly to the device via TCP/ IP and your existing network. All you need to do is program the functions and steps to produce the end result. This allows for easier and quicker connectivity, as well as fast and easy access to control options. TCP/IP and newer wireless advances are also allowing for simplification of the average conference room. Microsoft’s Sync, Crestron’s AirMedia, and Apple’s Air Play are systems that can connect audio/ video sources to your AV display(s) wirelessly, using only your existing WiFi network, with minimal setup and configuration. Most of you are familiar with MS Sync and Apple’s AirPlay. Crestron’s AirMedia is a plug-n-play “presentation system” (not just a wireless transmitter) that similar to other transmitter systems, allows any user on any device (PC, Tablet, iPhone, Andriod) to quickly download software allowing them to share their presentation or documents to your conference room or any display, completely wirelessly, but the AirMedia device is different as it allows the user to “Pause” and do other things on their PC without it showing on the display, allows up to 20 users to see and share the same screen, (even remotely) or four users to do a four-way split on the display showing four different PC or tablets presentations, simultaneously. Thus, no cables from the cable-cubby in the table are needed to manage. You no longer need an expensive quad splitter to see multiple (up to four) windows on one screen. Dan Fulmer, CTS, DMC-E, has BS from UCF, where he studied engineering and computer science. He founded FulTech Solutions, Inc, in 1995, which is a nationally recognized and award-winning systems integrator. He contributes blogs, features, and reviews to industry publications such as AV Technology magazine and InfoComm All Voices.